It takes a lot of work to get information together to have an idea what the weather might do. Five young men collect such information at the Đầu Đẳng Hydrological Station. They live a simple life, far away from any shops so they grow vegetables and raise chickens to give themselves food. The nearest market is so hard to get to that if they bought food there it would last only a few days without being in a fridge. Twilight came when we were still deep in the forest. I could not stop thinking about the afternoon. We had been to the Đầu Đẳng Hydrological Station and met five young men stationed there, in the middle of nowhere. There were no local residents, no paved roads, no market and, of course, no electricity. It was accessible only by boat. Four times every day the men had to row a boat to the middle of the river and measure the water level. When there’s a flood, they have to measure 24 hours a day, no matter how heavy the rain or how strong the water flow. The hydrologists here collect data so that we at the National Centre of Hydro Meteorological Forecasting in Hà Nội can provide flood forecasts for midland and lowland river basins. It was getting darker and we were crossing the forest to get to our boat and back to town. Late afternoon in the mountains was very quiet and boring. It was so foggy we could not see far. From the boat, we saw flickering lights along the river. There were few houses in each hamlet. We were getting back to normal life on the other side of the Năng River. Then we came to Ba Bể Lake. I could not tell where the water ended and the mountain began. We only saw one light in the distance. We got to the shore a few minutes past seven. I looked up, the sky was full of stars. It turned out that it was only foggy above the water. Had we left the hydro-station earlier, we would not have felt the solitude and isolation our colleagues experience every day. When we left, the warmth we brought left with us. And they must have felt even more isolated. The five young men I met at the Đầu Đẳng Hydrological Station joined us for dinner at the centre of Ba Bể Park that evening. Each had a story to tell. Nông Văn Chất, 31, was an ethnic Tày man from Ba Bể District. I asked why he decided to take this job. He said, “Well, I saw that the station was being built, then I thought I’d go to school and then go to work at the station.” What a simple job decision! After three years studying at the Natural Resources and Environment School in Hà Nội, he went to work at the Station, where he has been for several years. “How much do you make?” I asked. “I get a little more than VNĐ2 million,” he said with a shy smile. That is less than US$100. From the shine in his eyes, I knew that he would keep working despite the meagre income. Money here does not matter as much as in town because there’s little opportunity to spend it. The closest market takes place only once every five days and it’s hard to get to. It has to be approached by boat, crossing the Na Hang hydro-power reservoir. Even if you have a little more money to buy food, you can’t keep it for long without a fridge. They hydrologists grow their vegetables and raise chickens. They are almost totally self-sustaining. So being a meteo-hydrologist in a remote station means you need to not only know how to do your job, but also have some basic knowledge in poultry raising and gardening to survive. The second man we met, Nông Văn Tiếp, 32, is from Bắc Kạn Province. Still single, Tiếp exudes a cheery spirit. He brought out two big cans of rice liquor he had distilled using herbal fermentation. It was so soothing, the liquor. Tiếp and his men spent an hour rowing their boat to the bigger station to have dinner with us. He would have to row yet another hour back for the 1am report. In his heavy accent, Tiếp said to us, “During flood time, I can swim, but the rules are that you must not leave the boat. I’m not afraid of heavy rain, nor strong flood. I’m only afraid of losing the steel fish (a weight with a flowmeter inside). I know how to deal with this situation. I learned it all at the weather school in Cầu Diễn on the outskirts of Hà Nội. The fish weight has a little apparatus inside that measures the current flow, its depth and the level of turbidity in the current. It’s tied with a cable to a point lower downstream. It takes four to record data in case such a flood hits. And when a flood hits, they need to be out there measuring the water every hour. The third guy we met was Vi Đức Mạnh, 30. He’s signed a contract and is a permanent staff member, so his wages are higher. Every time he goes home, he puts his motorbike on the boat and then when he gets to shore, he drives home. In charge of the station is Nguyễn Huy Hoàng. He’s stationed in Đầu Đẳng but his wife and children live in Thái Nguyên. He also goes home once a month, and has a very special assignment at the same time: picking up the monthly payment for everyone else at the station. Everyone entrusted him with their bank cards and passwords. If they hadn’t done so, there would have been no way for them to withdraw cash from the accounts. Hoàng’s wife and children have come up to Đầu Đẳng to see him only twice since he started there. “Then why doesn’t your wife come here to see you more, it’s so beautiful!” asks a young reporter traveling in the visitors’ group. Hoàng looked down, and did not answer. If one were to ask me what impressed me most when I visited Đầu Đẳng, I would say first, the green young rice paddy, clean and beautiful at the foot of the station. Secondly, the men’s restroom was also surprisingly clean. They also raise many chickens along with cats and dogs. Life seemed normal when I saw two mother hens taking their chicks out into the garden. But Đầu Đẳng is not the most isolated or least accessible station. “Stations in Hoàng Su Phì or Đồng Văn Districts of Hà Giang Province are tougher to work in,” one of my colleagues said when we moved on to the next destination. The Chợ Rã Meteo-Hydrological station sits on top of a hill covered by different kinds of banana and bamboo plants. The house is modest. The least comfortable of all the places we visited this time. 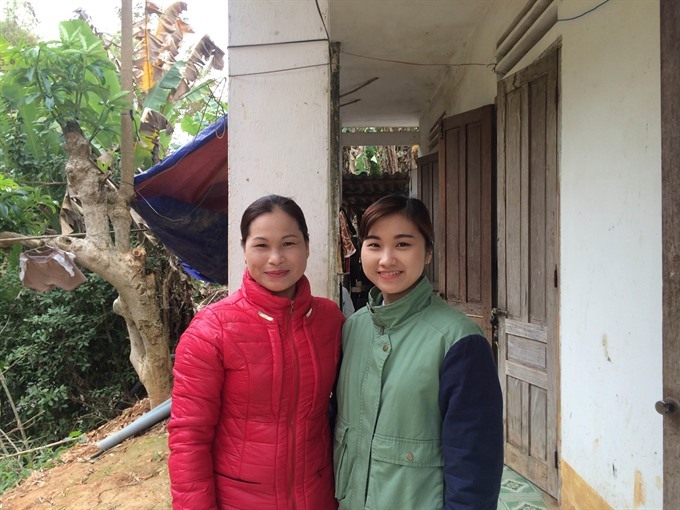 Stationed there is a tiny family consisting of a mother, Hoàng Thị Tính, and daughter, Ma Thị Minh Hảo, a fresh graduate of the Natural Resources and Environment College. Both mother and daughter measure and send their reports every single day of the year, including New Year’s Eve and New Year’s Day. The next station we visited in Bắc Kạn was a brand new house. Flowers and vegetables grow everywhere around the house. The residential house is located behind the office. A tranquil river runs lazily behind it. Life seems so peaceful here for the staff, all of them are very young, energetic and cheerful. My colleague in Hà Nội, a hydrologist named Bùi Đình Lập, heads a team that works every day with the data provided by the stations located in the mountains. They send in the data for all the rivers in the north and all the hydro-power reservoirs, including Na Hang right below Đầu Đẳng Station. Lập works closely with all the men and women everyday. But they rarely meet. He had only been to Đầu Đẳng once before. This was his second time. But the hosts were so busy preparing to receive our big group of 30 visitors, they did not have time to chat. We all turned even more silent on our way back. We all were overwhelmed by our visit and the people we met. They talked very little, kept to themselves. They lived and worked and hoped for improvement in their lives and work. Their stories moved us. In the fading afternoon light, their tidy house in the middle of a vegetable garden, the chickens searching for food, the lazy dogs lying in the front yard and the cats that ran away to hide from us. It’s such a peaceful pastoral life. No complaints about the low pay or lack of comfort. They would all say, "It’s our duty!" Twilight is the time of day just before it gets dark in the evening. If a place is accessible only by boat, you can only reach it by boat. A hydrologist is someone who is an expert in and works with things to do with how water gets around. A river basin is an area where a river receives water, and flows. A hamlet is a collection of houses that is too small to be called a village. Isolation means being far from other places. If someone earns a meagre income, he or she is paid only a little money. Hydro-power is electricity made by capturing the energy of moving water. A hydro-power reservoir is dam that was built for that purpose. Self-sustaining means to be able to stay alive and well without help from anyone else. A meteo-hydrologist is a hydrologist whose job also involves studying the weather. Poultry means birds such as chickens, ducks and geese that are domesticated and raised for their eggs and their meat. Distilled means going through a process that involves purifying a liquid by boiling it and then collecting the water vapour that the heating produces. Fermentation means brewing something by letting it get old. If something is soothing it makes you calm. A flowmeter is a device used to measure the flow of water. An apparatus is a device. The level of turbidity means thickness, or muddiness. A contract is a deal based on an agreement. An assignment is a task. To entrust someone with something means to trust them with it. Modest means not very smart but also not very shabby. A residential house is one in which people live. When the light is fading it is slowly going away, giving way to darkness. A pastoral life is one that involves raising farm animals. Nông Văn Tiếp’s marital status. Pretty things that grow around Bắc Kạn’s house. The type of transport people at Đầu Đẳng Hydrological Station use to get to the nearest market. The number of people stationed at Đầu Đẳng Hydrological Station. 1. Single; 2. Hydrologist; 3. Flowers; 4. Boat; 5. Five.